It's interesting to study details of good architecture, ancient or modern, and see what makes it visually satisfying. This building would have been handsome enough if the lower windows were the same rectangular shape as the smaller upper ones, but arching the lower ones certainly adds impact. The sizes of the two sets of windows add further contrast, as do the straight window frames above and the stone block framing below. There are unifying elements as well, such as the identical color scheme of creamy framing against a bronze plaster wall, and the multi-paned upper windows that repeat the shape of the aged iron grilles below. 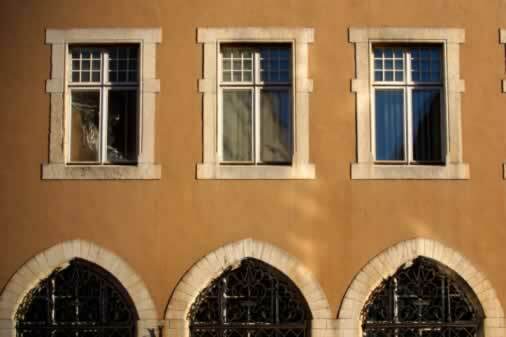 Without even seeing the rest of the building or street, it's easy to assume that this eye-pleasing windowed wall is in southern Europe, North Africa, or Spanish-American countries. Borrow the ideas for your own home.